OlliOlli, a rare PS Vita exclusive, is a 2D skateboarding game that could potentially revitalize a genre that has laid dormant for years. Skating games reached the point of oversaturation years ago; who would have guessed that a small indie title like this could manage to be such a breath of fresh air? 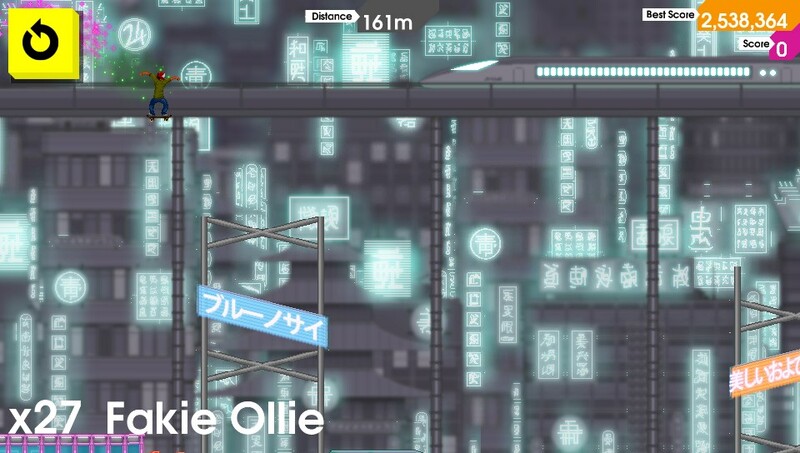 It’s amazing how much OlliOlli does with so little. The control scheme is reduced to what is essentially two buttons: the left analog stick and the X button (with the left and right bumpers being used to rotate the skater, if desired). This seemingly simplistic method is actually deceptively complex. The left stick is used to perform tricks and grinds (of which there are over 120 total), while the X button is used to stick the landings. This takes some getting used to — after years of playing Tony Hawk, it feels weird not to use X to ollie — but it really doesn’t take long to start to feel natural. The decision to require an extra button press in order to perfectly land a trick or grind is a stroke of genius. By hitting X at the last possible second, you will get a “perfect” rating that delivers the most points possible. This adds a whole new element to the gameplay, as you can pull off the world’s best combo but get little in the way of points if you don’t nail the landing. The game also keeps you on your toes by requiring the analog stick to be pushed down in order to achieve a “perfect” grind. Again, there is a little bit of a learning curve here, but once everything clicks, it’s as smooth as can be. There are 50 levels in total, and each one has a set of five challenges to complete. These are similar to Tony Hawk’s Pro Skater in that some challenges are for hitting a certain point total (both overall and for combos specifically), picking up spray cans scattered through a level, hitting certain gaps or pulling off a specific trick. At first, they start off innocently enough, but it doesn’t take long for the requests to get more and more difficult. If you’re able to complete all five challenges on an “amateur” level, you will have access to its corresponding “pro” level. If you’re able to five star every single level in the game, you unlock the extremely challenging RAD mode. Good luck with that. There are also “Spots” that can be unlocked by completing each level. These are basically condensed stages that are set up to maximize combo potential. The idea is to string together as many tricks and grinds as possible before you either hit the ground or reach the end of the stage. The game will take note of your best score and tell you your current position on the world leaderboards. I managed to make it in the top 20 once or twice, but surely that will go down as more and more people start playing. It’s fun to see just how far off you are from the world leader, but it would be even better if there were a way to compare your scores with those on your friends list. Perhaps this is something that could be added in with a patch? There’s also a neat little mode called Daily Grind that’s reminiscent of Spelunky‘s daily challenges. A new level is crafted every day where you get one chance to pull off as big of a combo as possible. You can practice as much as you like, but only your “official” run counts. It’s a fun way to keep the competition going. While there is plenty of content to offer, what makes the overall package so great is that it is so easy to pick up and play. Each level lasts for about a minute, and there is a big yellow button in the left hand corner of the screen that can be used to restart at a whim’s notice. Trust me, you’ll get well acquainted with this button. Everything also starts immediately — there are no delays whatsoever. By keeping everything streamlined so well, this just adds to the addictive nature of the game. It’s one of those “oh, I’ll just play one more level” type games where it’s easy to get sucked in and play for hours without knowing it (a la Super Meat Boy). 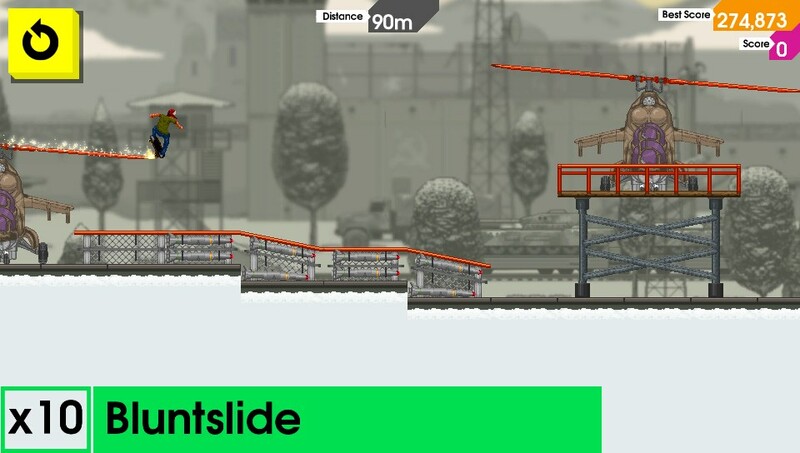 In terms of its presentation, OlliOlli offers little in the way of eye candy. The graphics aren’t anything special, and it’s often difficult to differentiate between certain tricks. However, Roll7 really nailed the soundtrack. Its mix of upbeat and chill electronica has a certain hypnotic feeling to it. Quite the contrast from the raucous punk rock songs in Tony Hawk, but it works surprisingly well. With its twitch gameplay, precise controls and seemingly unlimited replay value, OlliOlli pretty much hits all the right notes. It could benefit from friend leaderboards and more customization options, but these omissions hardly detract from what is an overall addictive and enjoyable experience. If this game is any indication, 2014 is shaping up to be a hell of a year for PS Vita owners.